As we covered in part one of this series, the success of a trial can quite often hinge upon the initial research that is done beforehand. Before you can embark on the process of recruiting patients to a clinical trial, data must be collected to provide background and insight. Once you know who it is you want (and need) to recruit, you will be better able to construct a detailed and well-thought plan of action. According to a study by Tufts Center for the Study of Drug Development, an estimated 30% of clinical trials under-enrolled at any given moment. A focused approach to your clinical trial gives you the best leg up to enroll the patients that you require and set yourself up for success. How many patients do we ultimately need? Over what time period do we have to recruit? How difficult or easy is recruitment likely to be? How ambitious can your goals be while remaining grounded and realistic? The answers that you provide to these questions should be clearly defined and allow for quantitative assessments where appropriate and beneficial. The objectives you set should include: clear statements of the time frame of the study, a definition of the patient population for whom the trial is intended, and how you expect patients to benefit (and for how long). As part of developing recruitment strategies, establishing realistic timelines and communicating expectations are extremely important. Try creating a summary of worst case, best case and realistic scenarios and a summary of suggested changes that would make patient recruitment more fruitful. Be realistic and conservative in your estimate. Don’t inflate or overestimate your enrollment potential. Set realistic expectations for completing trial enrollment by detailing anticipated factors that could influence your site activation, screening, and enrollment timelines. Map out anticipated events, even if your estimations are rough at first, to identify potential pitfalls and hang ups. The general assumption tends to be that potential participants are ready and willing to join a clinical trial. While this may be true of some who have already done their own research, this is not always the case. Patients are interested in learning as much of the trial as they can before they decide to join. On your landing page, share a summary of the trial, whether a device or drug is being tested, and (if a drug trial) how it will be administered. Potential participants who are hesitant or on the fence may only need that extra bit of detail to win their trust and get them to recruitment. As you can see, there is a methodology for patient recruitment of clinical trials is beginning to take shape. 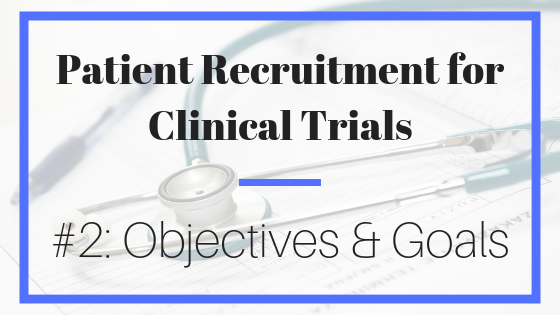 Patient recruitment objectives are one of the most important parts of the clinical trial process to special care with. Realistically evaluate your strengths and weaknesses, identifying threats and opportunities associated with the specifics of the study. Only when you are aware of the potential risks in the patient recruitment process can you move forward to identify solutions that will keep your study on track. If the recruitment period extends past your initial timeframes (as it can easily do), subsequent objectives can be affected and anticipated costs can creep up. The name of the game is anticipation and planning. Trial teams that understand their limitations with patient recruitment and prepare strategies in advance to formulate solutions will undoubtedly have better outcomes than those who lack proper preparation with their patient recruitment.